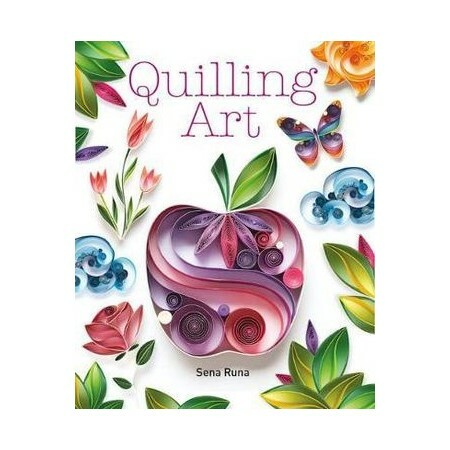 The popular craft of quilling is given a stylish and contemporary update in this fabulous book by Turkish paper artist, Sena Runa. Inside Quilling Art there are 20 stunning projects to make and then display. Beautifully stylized and with a clever use of color to create exciting effects, these projects will hang well in the most modern of homes. Designs include a butterfly, sail boat, dancer, confetti, cocktail, cloud, heart, cat and mermaid, to name just a few. The projects vary in complexity and will appeal to beginners and experienced quillers alike. They are broken down into concise, fully illustrated step-by-step instructions that are easy to follow, and templates are provided. All the tools, materials and techiques you need to get started are fully covered. The projects will appeal to a wide range of ages, and would make lovely gifts for friends and family. Once you have learned the techniques, you can create your own designs for any number of occasions...the possibilities are many and varied with this fun and absorbing paper craft. Turkish born Sena Runa discovered her love of paper quilling a few years ago and now devotes all her time to it. She has enjoyed developing her own particular style and approach, using bright pops of color or graduating shades. The result is fun, fresh and modern.